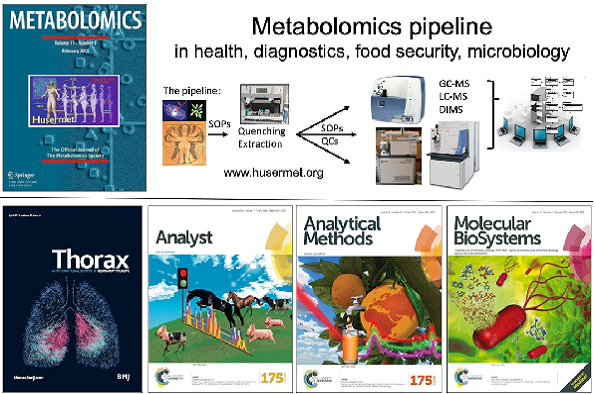 Metabolomics is a growing discipline that allows the analysis of the thousands of structural different small molecules found within a biological system. These metabolites can be measured using a variety of different analytical approaches and we have developed GC-MS and LC-MS for this purpose (Dunn et al., 2011). I shall provide an overview of metabolomics and lessons learnt from of our large-scale human serum metabolome project where we profiled 1200 healthy individuals (Dunn et al., 2015). Using these protocols we then went on to profile another ~1200 ageing individuals and identified key metabolic dysregulation which were drivers behind human frailty, which were valiated in a further ~760 ageing individuals (Rattray N.J. et al., under review). Dunn et al. (2011) Procedures for large-scale metabolic profiling of serum and plasma using gas chromatography and liquid chromatography coupled to mass spectrometry. Nature Protocols 6, 1060-1083. Dunn et al. (2015) Molecular phenotyping of a UK population: defining the human serum metabolome. Metabolomics 11, 9-26. Roy Goodacre is Professor of Biological Chemistry at the University of Liverpool. His research interests are broadly within analytical biotechnology and systems and synthetic biology. He has helped establish mass spectrometry-based metabolomics for long-term studies and employed metabolomics for clinical and plant studies, as well as for understanding microbial systems. He has also developed a variety of different Raman spectroscopy approaches for bioanalysis with a particular focus on metabolite quantification and chemical image analysis. He helped establish the Metabolomics Society, is Editor-in-Chief of the journal Metabolomics and on the Editorial Advisory Boards of four other journals.